Limited employment outcomes of young adults with autism spectrum disorder (ASD) and a recent surge in incidence of ASD diagnosis indicate a need for more effective school-to-work transition interventions. Community service opportunities can support young adults with ASD to gain skills, explore careers, and develop networks that can lead to meaningful employment. This research-to-practice toolkit offers practical solutions for transition coordinators, educators, and others who want to implement community service activities that build skills for youth with ASD. This publication addresses building social skills. Other publications in the toolkit focus on career exploration and self-determination. The source of much of the information presented below is qualitative research conducted in Florida, completed as part of the Service Works for Youth with Autism project. Additional information is derived from other Institute for Community Inclusion work on transition planning and service contributing to employment for youth and adults with disabilities. Service Works for Youth with Autism is a three-year initiative that explored the impact of community service on career development, self-determination, and social skill building for youth with ASD in two Florida counties. Duval County includes the city of Jacksonville and is located in the northeastern part of the state. Lee County includes the city of Fort Myers and is in a southwestern coastal region. During the five-month structured community service intervention (called Project Impact), students with ASD mapped their communities, collaboratively identified a community problem, and developed and implemented a subsequent community service project. Project Impact [PDF] was created by the Florida Governor’s Commission on Volunteerism and Community Service, Volunteer Florida. It is an intensive five-month community service experience planned and implemented with youth with disabilities. Project Impact uses a comprehensive guide to organize its activities. Project Impact youth are guided by trained AmeriCorps facilitators and mentors. These mentors are AmeriCorps members serving formal terms. Other key players may include personnel from a local disability organization and classroom teachers who serve as site coordinators and help support project activities in between meetings. AmeriCorps is one of three core programs of the Corporation for National and Community Service. AmeriCorps programs provide opportunities for Americans to make an intensive commitment to service. The AmeriCorps network of local, state, and national service programs engages more than 80,000 Americans in projects around the nation each year. Project Impact starts with a student-led community mapping exercise, in which students identify a community problem and the resources needed to address it. The students develop a plan for a service activity that will address the problem, and then implement the service activity. Each month, students meet with peers and their AmeriCorps facilitator . Together, the students outline their roles, their responsibilities, and exactly how the service project will unfold. They participate in regular reflection activities that allow them to consider the skills they are developing and the impact the students are having in their community. Through Project Impact, Florida AmeriCorps programs, in conjunction with a range of community partners, have implemented 40 community service projects with 500 youth with a range of disabilities in 12 Florida counties. Service projects have included literacy efforts and tutoring, grounds beautification at local parks and zoos, cooking meals for those experiencing hunger, toiletry and canned food drives, recreational activities at assisted living facilities, and even restoring oyster beds. The findings in this publication are based on 23 in-person interviews with a range of participants in the Service Works for Youth with Autism project. Participants were asked about their experience in the project as it relates to employment. Interviewees included six students, six teachers/school staff, three Project Impact facilitators, five mentors, and three parents. Eight participants were from a Lee County high school, seven were from one high school in Duval County, and eight were from a second high school in Duval County. The students who participated in the interviews were of diverse ethnic and cultural backgrounds, ages, and severity of disability. All six students interviewed were male. School #1 in Jacksonville, FL conducted a school-wide food drive, engaging the larger school community in the effort. They created posters, drop boxes, and announcements for the morning school news. They delivered, sorted, and stocked the food at a local food pantry. School #2 in Jacksonville had many students interested in animals and animal care. They prepared animal foods and beautified grounds at the Jacksonville Zoo. A zoo contact visited classrooms to discuss the range of jobs offered at the zoo. Broadening social networks. As part of the service experience, students met and interacted with new people. This included the facilitators who guided the students through the Project Impact curriculum at bi-weekly meetings, as well as mentors, who were serving an AmeriCorps term and asked to participate in a support role. It also included professionals at the service sites, as well as students from the larger school community. Program staff observed friendships and reciprocity between the students. Furthermore, staff noticed an increased awareness and sensitivity from the other students towards the students with ASD. Fort Myers Project Impact participants decided to address the community need of hunger by preparing lunch for fellow classmates who experience food insecurity. They engaged the junior ROTC in recreational, team-building activities with the student lunch recipients as an after-lunch activity. Together, the students with ASD, the students who received the cooked meal, and the junior ROTC socialized while eating lunch and also while playing a range of games and participating in team-building exercises. Throughout the half-day event, program staff were struck by how the interaction naturally broke down social boundaries, noting how much more integrated the three very different school groups became. Furthermore, the social impact of the service project was not only on the service recipients, but on all three groups. One teacher described that when they were all interacting, she could see that they were sensitive to each other’s differences. For example, the naturally regimented ROTC students had to become more flexible in order to accommodate the students with ASD. In addition, the students with ASD had to challenge themselves to be more social and to interact with students who were receiving lunch. Identify your local service program. #1. Identify your local service program. Collaboration with service programs can benefit schools as well as the service program. While schools can create community service opportunities for youth that allow them to gain valuable experience, service programs gain access to qualified, committed participants. The local service community may be unfamiliar with the school and disability community, and vice versa. Therefore, a critical first step is learning more about each other. Contact your state’s service commission to help you identify service programs in your community. They also may be able to share examples of the types of partnerships occurring in other parts of the state. Once you’ve identified a local service program, set up a short, informal meeting. Be prepared to explain your school, students, and the goals you hope to achieve. Invite service staff to meet school staff and students. Ask them to present an overview of the community service options other youth have engaged in recently. Reassure service staff that you will help with student support needs. Remember, you are the one that likely knows your students the best. The service program will rely on you to offer accommodations. If you want to create community service experiences on your own, here are some tips to consider. Create structure. Establish a timeline for the service project, and stick to it. Meeting weekly until the service project is complete will promote continuity, especially for students who also have intellectual disabilities. Create formal agendas for each planning meeting that ensure full participation. Allow time for discussion about how each activity is building a skill needed for employment. Incorporate regular reflection activities. Such activities should connect each phase of the experience to skills gained and future career options. Use team-building exercises to increase peer connections, pro­mote group problem-solving, and build decision-making skills. See below for some ideas. Use committees to plan and implement different aspects of the project. A marketing committee might be in charge of letting others know about your project. A student interested in art might be elected to create posters. A student interested in photography might be in charge of documenting the project for the school newspaper. 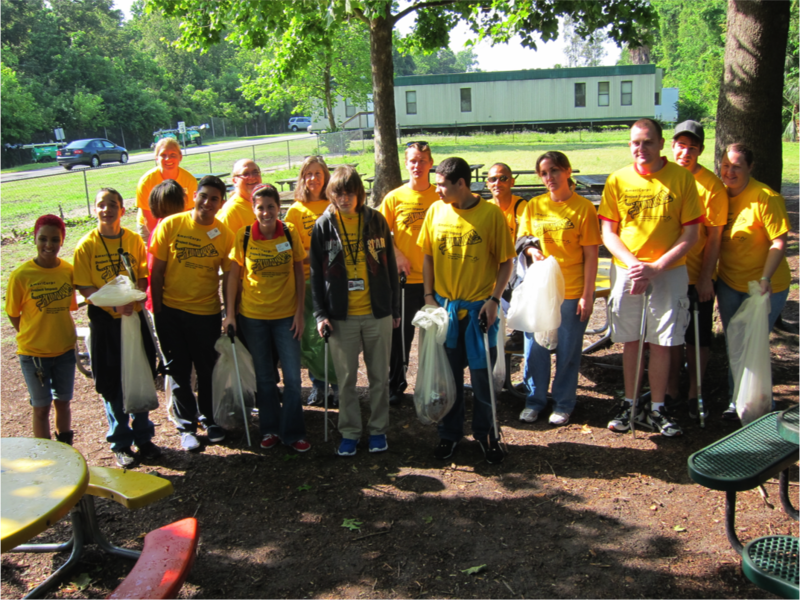 Coordinate a service day for students at an organization or within your school community. Assess the physical space and attitudes/sensitivity of staff at the service location in advance. Provide accommodations and etiquette training as needed. PREPARE: Introduce students to the issues that will be addressed, select appropriate projects, and provide background info and training. In the preparation phase, teachers, students, and a community agency begin communication regarding possible project ideas, choosing a real community need, linking the service project to the curriculum, securing necessary funds and administrative support, and writing an action plan. ACT: Engage in service to help others in the community. This action moves issues from students’ “heads” to their “hands.” In the action phase, the service project is implemented. REFLECT: Look back on the experience, raise and address questions, and assess the project or program. During the reflection, project participants consider the project’s impact on their own learning and career goals and on the lives of those served. CELEBRATE: Evaluate the service experience, celebrate accomplishments, and make commitments for the future. In the celebration phase, students take pride in the impact they made and receive recognition for their work. Now let’s consider ways to ensure that your community service experience builds social skills. Choose projects where at least part of the service occurs on school grounds. Projects completed on school grounds can facilitate interaction with the broader school community. This can reduce the stigma of students with ASD as “special ed” students. Have a toiletry or food drive that engages the larger school community. Hang posters and place decorated drop boxes throughout the campus. Market your project on the school news so other students can get involved in donating items. Recruit classmates from an adjoining classroom to deliver goods with your students. Students can research organizations in the local community such as food pantries or homeless shelters to deliver the goods to. Beautify school grounds during the school day. Ask students from a school-based club or group like the National Junior Honor Society, school government, or drama club to join your students in the effort. Tour the school grounds as a group. Have students vote on the area they want to beautify. Have students decide how they might beautify (Will they paint? Will they create art? Will they plant flowers?) and whom they might approach to donate supplies. This gets students from different classrooms and different social circles, regardless of disability, interacting with one another as well as interacting with the larger school community. Bring in as many outside facilitators and special guests as possible. Having an outside facilitator or co-facilitators is one of the many benefits of collaborating with a local service entity. Even if they do not facilitate the whole service project, they can often recruit special guests from community agencies such as food pantries, the humane society, or the parks department. Even if you are not working with a service program, reach out to local community agencies yourself. Invite a guest to tell students about what they do and how they help people in the community. In addition to bringing more options to the students, outside facilitators give students the opportunity to practice interpersonal skills with new acquaintances. Ongoing practice of interpersonal skills builds mastery, which is critical to future employment. Be creative in recruiting mentors. Ask the service entity to recruit those currently serving terms in AmeriCorps. Ask other students from the school, or alumni from the same general age group, to act as mentors. Mentors should not outnumber mentees; however, a good-sized mentor group creates multiple opportunities to practice social skills. Mentors are also invaluable in helping students adjust to unexpected situations that arise during service. Use team-building exercises to increase peer connections. Focusing on team support and communication helps shape the quality of the service experience. Learning about and experiencing the value of teamwork creates cohesion. Team-building exercises encourage students to interact and communicate in ways that may not otherwise naturally occur, and allow them to practice new skills, try out new roles, and develop group camaraderie. Team-building exercises can also increase peer connections, pro­mote group problem solving, and build decision-making skills. Community service for transition-age youth with ASD is a great way to make a big difference in the lives of others, all while your students are building social skills. Our study described how community service had an impact on building the interpersonal skills necessary for future employment and community inclusion. Through consideration of the above strategies, your students can explore careers in your local community, and can practice meeting new people and building relationships, all while filling a critical community need. This study was supported by grant R40 MC 22645 from the Maternal and Child Health Research Program, Maternal and Child Health Bureau (Combating Autism Act of 2006, as amended by the Combating Autism Reauthorization Act of 2011), Health Resources and Services Administration, Department of Health and Human Services. The Institute for Community Inclusion would like to thank our project collaborators: the Florida Governor’s Commission on Service and Volunteering (Volunteer Florida), and the Center for Autism and Related Disabilities (CARD) at the University of South Florida.